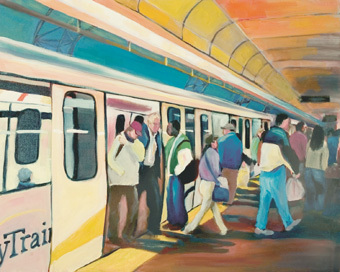 Commercial–Broadway Station by Dana Lu. **UPDATE** Due to weather conditions, the work at Commercial–Broadway Station was delayed. The pedestrian walkway to the Millennium Line trains (platforms 1 and 2) at Commercial–Broadway will narrow starting this Sunday, February 19th. We are working hard to ensure our system meets the needs of our customers. You may have seen, or heard, crews at Stadium-Chinatown and Commercial-Broadway stations working over the last few days and weeks. You’ve told us that you wanted more signage on the system and we are working away to make this happen. We’ve installed new signage at virtually every platform at Expo and Millennium Line stations. Right now, construction crews are installing a new fence to mount new directional signs at Stadium–Chinatown Station. To ensure our customers know where to go when they are on the train, we’re installing trackside rails and fences to mount large signs. If you’ve been on the Evergreen Extension, you’ll see similar fencing and signs installed between platforms. These signs are essential so customers can see what station they are arriving at and the route of the train. This work will continue on Sunday to Thursday nights between the hours of approximately 2 a.m. and 5 a.m. over the next couple of weeks. Residents in the area may hear nighttime noise as this work can only be completed when trains are not running. If we did this work during the day, this would mean we couldn’t provide service to Stadium–Chinatown Station. We recognize that this work has an impact on residents who live near the station and we thank everyone for their patience while we make these improvements. Beginning in early February, the pedestrian walkway to the Millennium Line trains (platforms 1 and 2) at Commercial–Broadway Station will narrow. Construction crews will partially demolish and reconstruct the existing pedestrian walkway over the Grandview Cut. The crossing will be narrowed through various phases. At the narrowest, the walkway will be reduced to just over four metres wide. When construction is complete, the new pedestrian walkway to platforms 1 and 2 will be 14 metres wide! Access to the station and from the platform will not change. Customers can continue to use the stairs, escalators and elevators to access the platform. 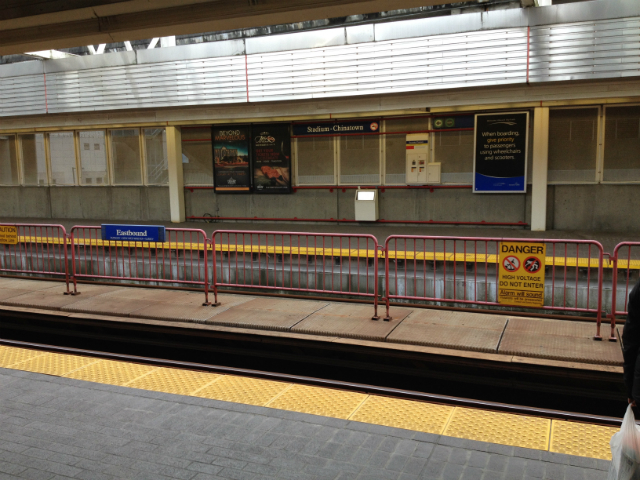 The walkway narrowing will not affect SkyTrain service. Hoarding will be put up along the entire length of the walkway. Additional lighting will be installed to ensure the area is well lit. Please allow for extra travel time when connecting through Commercial-Broadway Station. Customers should expect some additional crowding at the station during peak times. An additional platform for Expo Line trains, a widened crossing over the Grandview Cut and a new pedestrian walkway over Broadway. Together with the contractor, we are making every effort to minimize the impact of this construction activity. 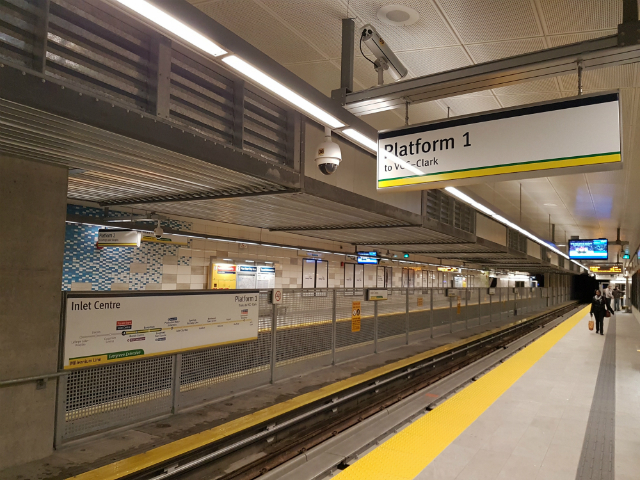 Crews will work around the clock to ensure that the upgrades are completed as quickly and safely as possible for the benefit of residents and users of the SkyTrain station. Construction is expected to be complete by next winter. We thank our passengers and neighbours for their patience as we make these much-needed improvements. please reach out to Customer Information by phone 604.953.333 or on Twitter. Phase One of the 10-Year Vision for Metro Vancouver Transportation means a lot of important transit projects have been given the green light, including Surrey-Newton-Guildford Light Rail Transit. This is just the beginning of the Fraser Rapid Transit project that will introduce modern, street-oriented rapid transit along King George Boulevard and 104 Avenue, connecting Surrey City Centre, Newton Town Centre and Guildford Town Centre. Now is your chance to weigh in on these connections and the overall project with an online survey and three drop-in open houses! 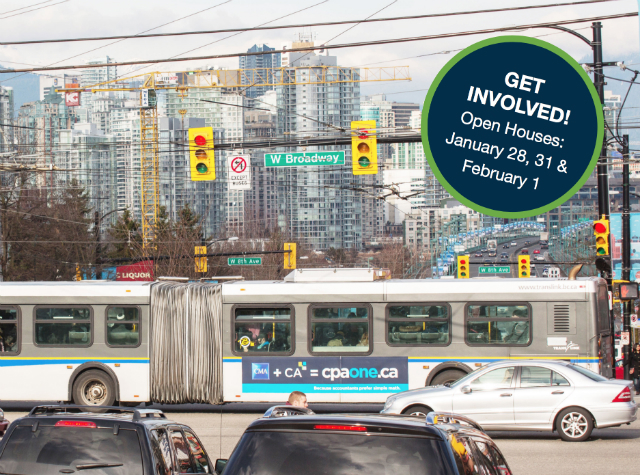 Provide feedback online from January 23 until February 13 (inclusive) at translink.ca/surreylrt. For more information, email surreylrt@translink.ca.